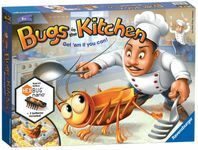 So you know your Terra Mystica from your Caverna - but do you know your Benny's Bunte Blumen from your Bugs in the Kitchen? 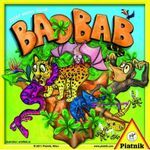 BGG is not know for its large number of ratings for children's games - so we might need some external help to find the gems released during the year. 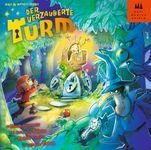 So, as Yule-times are getting closer I'd thought I'd put together a list of the children's games (meaning games that are mainly designed for children, not adult games that can be played by children) that received some accolades, honors and awards in 2013. Hopefully it'll ease some of the Christmas stress for some! 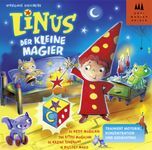 The list contains games directed at children under 10, it contains some reprints, and the list is ordered from games for the youngest to "oldest"
To play Linus, der kleine Magier, you shuffle 18 magnetized toy tiles (three each of six different toys) with 12 non-magnetized toy tiles (two tiles of each type), then spread them out on the table. 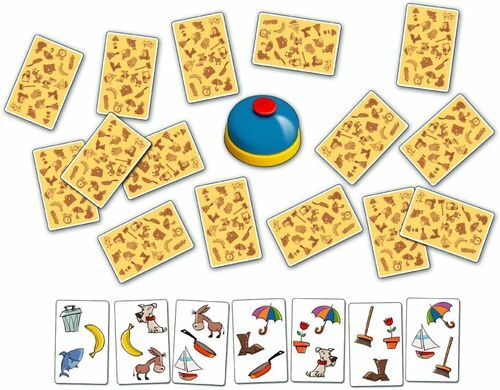 Shuffle the 18 search cards (showing three each of six different toys) as well, then give the youngest player the Linus wooden figure, which has a magnet on its underside. 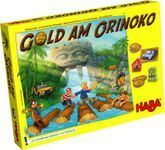 On a turn, the player looks at the top search card, then places Linus on one of the toy tiles that matches this image. Did you find an enchanted toy that sticks to Linus? Keep the toy tile and the search card, then give Linus to the next player. 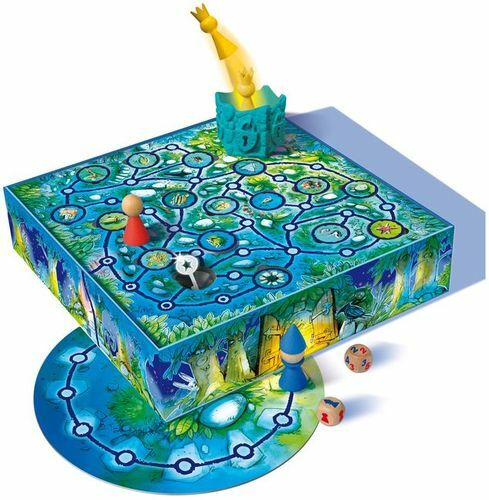 If, however, you found a regular toy tile, leave it on the table in the same location, then give Linus to the next player, who must now search for the same item (but with the hope of finding an enchanted one this time). 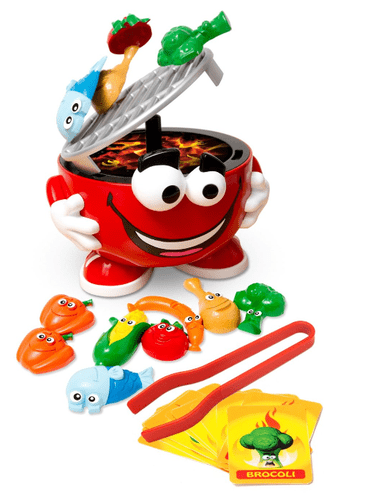 Once all the enchanted toys have been cleared from the table, whoever has found the most toys wins! 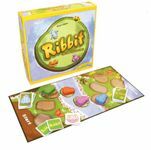 In this game designed for young children (ages 3+) you need to collect as many carrots as possible to feed the rabbit. The playing area consists of a plastic hill, with multiple plastic carrots sticking out and a cute bunny on top of the hill. Each players spins a wheel in its turn, to see which action they may take. Mostly this will be taking one or two carrots from the hill. There is also a chance that you have to skip the remainder of your turn or have to return a collected carrot to the box. When a carrot is taken out of the hill, there is a chance that the rabbit will jump (launched from the hill). Whoever catches the rabbit earns two more carrots. The game ends when all twelve carrots are taken from the hill. The person who collects the most carrots wins the game. In Hoot Owl Hoot! the players want to move all the owls back to their nest before the sun rises and the new days begins. Each player receives three cards; the fifty-card deck includes 36 color cards (six each in six colors) and 14 sun cards. Players keep their cards face up in front of them so that they can work together to strategize how to move. 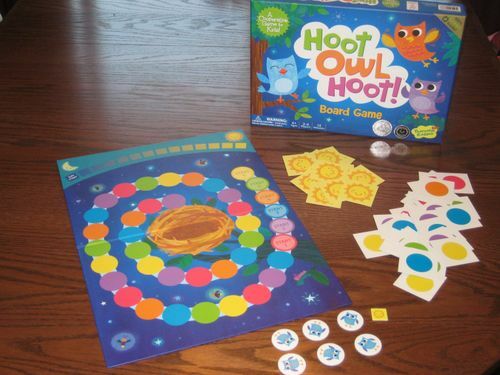 If a player has a sun card, on her turn she must discard the sun and move the sun token one space; if she has all color cards, she discards any one color card, then moves any owl to the next open space of that color. If an owl "flies" over an owl on a space of that color on its way to the next open space, all players make a hooting sound! Players stick their seed discs onto each squirrel's stem. If a player's squirrel reaches a matching-colored planter with a free space in it, she can slide her seed disc into the planter. Now it's all about nurturing and caring for the seeds. This is done with the symbol dice: watering can, rain cloud or sun – they all have different effects on the little plants' growth. The plants grow after being watered and they start to flower when the sun shines. 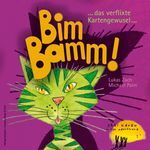 Your goal in Bennis bunte Blumen is to be the first to reach one's tree fort after the work is done. 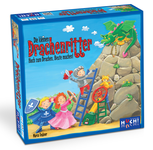 Players are stacking items, putting them one on the other by the 3d dragon mountain - the stack they will create will help them to get to the dragon loot. They must be very careful, as one wrong move may destroy their progress. Also not all items can be stacked one on the other - only specific colors can go together. Veggies to grill, and some chicken and hot dogs too! But to win you need 3 of each. Pick a card, it will tell you what you need to grill next. 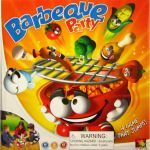 When you pick that card again, it means that it is ready and you need to remove it… BUT… you better be careful, because this friendly barbeque doesn’t like to be tickled… One false move and BOOOMMM and your meal will be late! 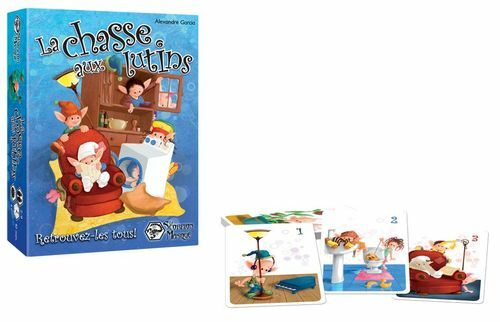 In La Chasse aux Lutins, many cute elves are hidden in your house. The player needs to find where they are hidden and catch them before anyone else can, and whoever collects more elves on his cards wins. How do the elves hide in your house? They get a little help from the players. 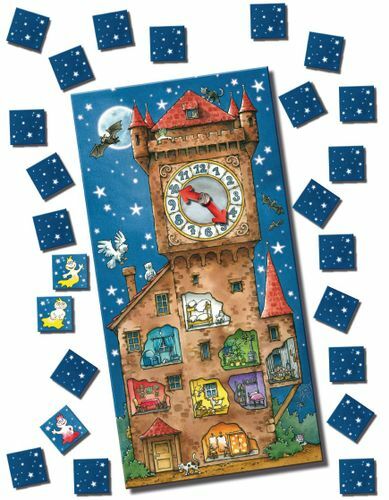 In the basic game, the cards have one, two or three elves on them, and these cards are split evenly among the players. The players then go into different rooms in the house and hide the cards, with the one elf cards being fully visible, the two elf cards being half hidden, and the three elf cards being completely hidden. 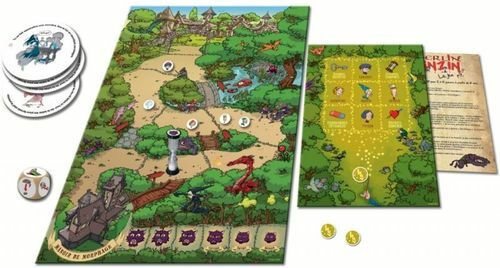 Players then start from a central location and hunt for cards, staying away from the room in which they hid cards since they already know where to find those elves! 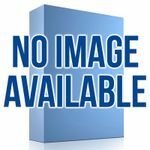 Speedy Bee is an observation and speed ​​game. The bees are looking for pollen. The first player who have six pollens wins the game. The game includes three designed dices with four small balls representing the primary colors (blue, yellow, red) and black. The board has six pollen balls, three with the color of the dices and three representing the mix between the primary colors (green, purple and orange). And the black color is used for the queen of the bees at the center of the board. Each turn, one player rolls the dices and then all players have to catch the correct pollen balls depending on the color dices and according to the color mixing rules. If you get the correct ball, you win a pollen token. If you are wrong, you have to give one back. The ladybugs want to reach the top of the flower! But they need the players' help and lots of crawling and flying practice to do so. Can you help your ladybug reach the top first? Be the first to complete a flower by collecting stem cards and a blossom card. Players decide on how tall they want the flowers to be, e.g. 4 stem cards tall. Stem and blossom cards are put in separate stacks, face down. Players take turns taking the top card from the stem card stack. 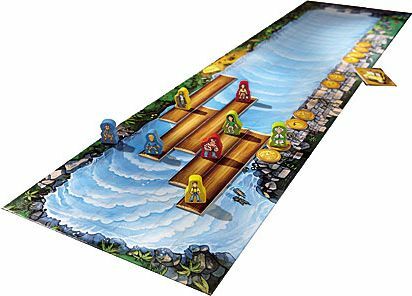 The active player looks at the task described on the back of the card and tries to complete the task. If he/she is successful, he/she gets to keep the card and puts it down in front of him/herself. If he/she fails, the card is returned to the bottom of the card stack. If a player has collected the agreed-upon number of stem cards, he/she gets to take a blossom card instead. The first player to have built a complete flower (consisting, in this example, of 4 stem cards and a blossom card) wins the game. 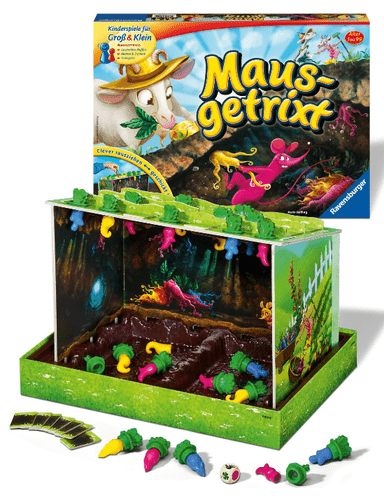 Mausgetrixt is a memory game about harvesting vegetables. 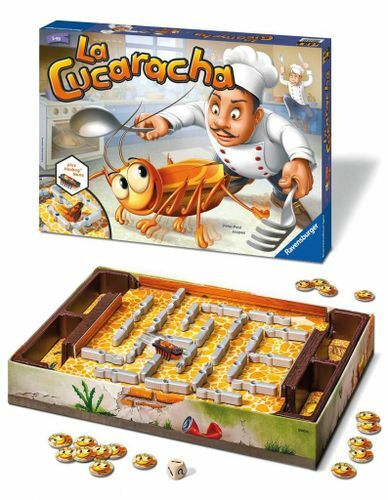 One player (the mouse player) arranges the vegetables and mice under the board. On the upper side of the board, you only see leaves. The other players roll a colour die and than look at a plant. If there is a vegetable or mouse of the same colour attached to the leave, the player can remove it. If the die shows a mouse, the mouse player may remove one vegetable from the bottom of the board. The mouse player wins, if all vegetables are removed before all 3 mice are removed, otherwise all other players win. 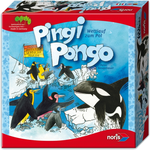 Each player plays with a 3-headed penguin-family. The penguins are on their way to the south pole. They jump from one clod to another and need to take care that they preferably land on one that isn`t crumbly. Sometimes they can also take the faster way through the waterr, but only, when the orca is not around. As the orca lurks on the way of the penguins and always appears at a different place. 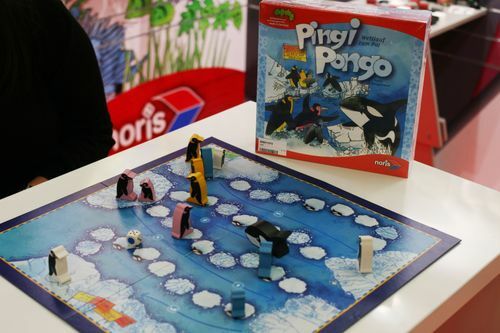 Whose penguin family reaches the South Pole first, wins the game. Turtles are not always in a hurry, but even they get to be in a race to try and become the first turtle to get to the tasty salad at the other end of the field. But since turtles don’t have a lot of endurance, they like to rest once in a while – preferably on the back of another turtle so that they can get carried for a little while. Will the game board tip down or not? 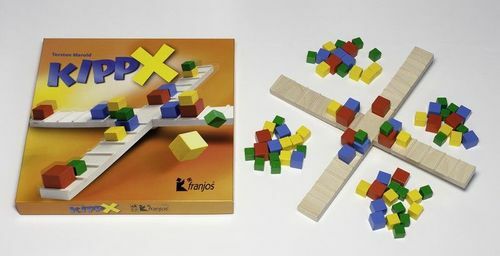 That's the question players face each turn in KIPP X, a captivating and challenging balance game that's yet easy to play. Just place a wooden block on the cross-seesaw and that's it – if it were not for the tipping. 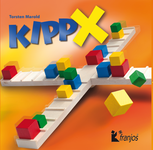 To win KIPP X, you must be the first to get rid of all your blocks. To do this, you carefully position them one at a time on one of the lifted-up halves of the cross-seesaw. At some point, however, the weight becomes too much and the cross-seesaw tips down. If this happens, you must take any block(s) that fall off. Thus, you can't be too bold when placing blocks on the upraised planks – but maybe you can place just one more block. 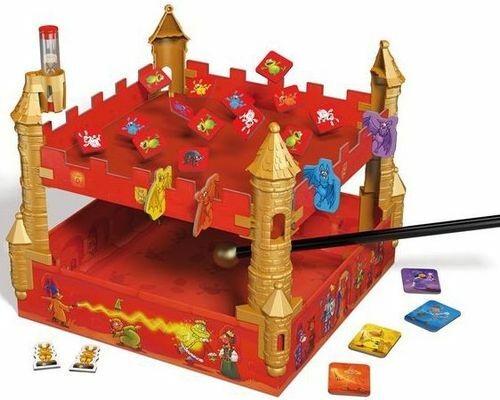 Time for a magic tournament at Magicstone Castle! 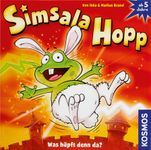 In Simsala Hopp, the young player magicians need to use their magic wands to transform frogs into hares while the animals fly through the air – but if they conjure things too freely, they risk sending animals arcing too high and landing outside the castle, and shenanigans like that will cost the magician points. Whoever can transform many frogs into rabbits without being too careless will collect the most tournament chips and win. 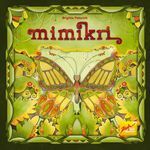 At the start of Mimikri, all twenty butterfly tiles are placed face down in the middle of the table in the shape of an rectangle. One of the five picture tiles is then inserted into the special "camera" included in the game; this camera consists of a squarish cardboard device with a mirror standing vertically on the diagonal of the square, along with a cut-out "wing shape" on the bottom of the camera. When a picture tile is inserted underneath the cut-out, the "camera" will create a butterfly from the part visible through the cut-out together with the mirrored wing. Once players see the image of the butterfly created, they now try to find this specific butterfly by turning the tiles face up, one by one, until a player finds the matching butterfly. Once a player succeeds, he collects the matching butterfly card. The next player now exchanges the picture tile, trying to insert the next one in a direction resulting in a butterfly he is able to locate immediately. This is more difficult than it seems as you have to imagine the butterfly just from the picture before inserting it. The player who collects the most butterfly cards wins. 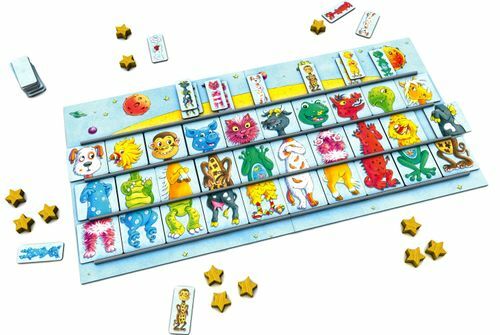 16 double-sided tiles with animal pictures are placed in a 4x4 grid.There is a stack of 15 cards with the same animals, and each player draws one of these. This shows his/her secret goal. Players now take turns flipping tiles. 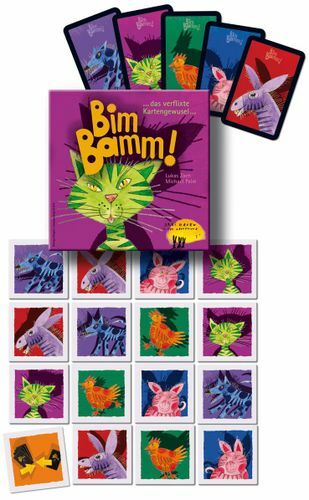 When an animal is showing on five tiles, the player(s) who have this animal as their goal shout "BIM BAMM". The first player to do that gets the card. The winner is the first player who has three cards. This dexterity game consists of a cardboard tree trunk and 110 cards. The cards are dealt to the players who then take turns placing them on the trunk. 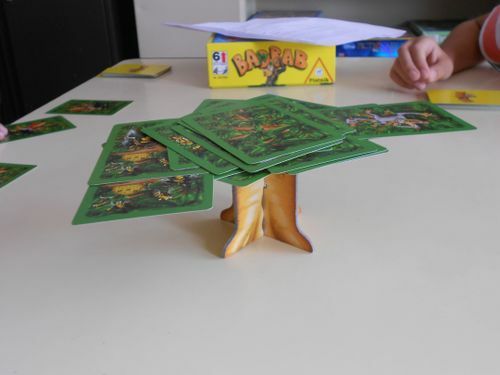 For each card type, there are different rules as to how to place the card: leopard cards have to be dropped onto the tree, branches and monkeys have to stick out from the other cards, snakes can be pushed underneath other cards, etc. All cards which fall down are taken by the active player. When a player has no more cards, everyone counts their remaining cards plus any taken ones. Whoever has least cards now is the winner. 2 to 4 players build circus tents and wagons along the fields of the island. Using the appropriate side of the map either 2 or 3/4 players can join as the characters from the movie: Alex, Gloria, Marty or Melman. Each field generates a specific resource from the game theme: Wood, bags of sand, popcorn, wool or nice juice cocktails. 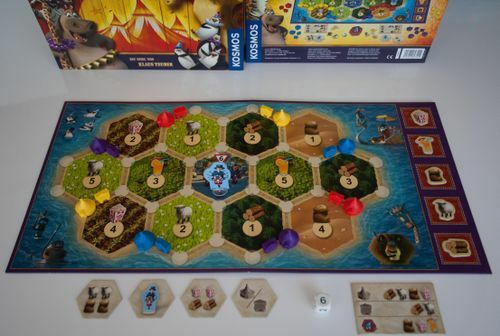 Each player starts with two circus tents on a specific spot on the island, and they can use the resources they acquire to build tents, wagons or get help from the Pinguins. By setting up more tents, they can expand their network; the more tents they build, the more resources they may receive. Just watch out for the controlling Zoo keeper! Be the first player to set up all of your seven circus tents, and you win! 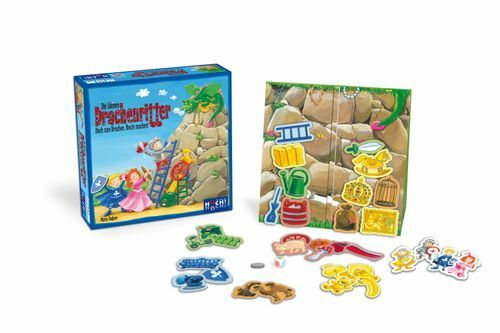 In the game players join forces to lead all the characters to the village before being caught by the cat. Players will send (literally) spells on the track according to a precise technique indicated by a special dice. According to the image indicated by the spell, players will advance a character, use a secret passage, give a character invisibility or reverse the hourglass. But, these spells can also have side effects that will waste precious time to players. The cat wall advance whenever the hourglass will have elapsed (ie once per minute)or whenever and 3 spells have been sent off to the track spells. If the cat catch up a character on the board he or she will be eaten.